Although I’m not one for gambling, blackjack is the type of game that can even make someone like me-- who earned her one and only grade of D in Math 90 and fulfilled her baccalaureate math requirement by knitting a scarf and writing a physics paper on string theory-- feel like a mathematical wizard. One only needs to count to 21 after all and if you can handle basic addition, you can play the game, but after hearing about the group of math geniuses from M.I.T. “Who Took Vegas for Millions” in the subtitle of Ben Mezrich’s nonfiction work Bringing Down the House, I realized that mastery of the game is best left to the experts and those who no doubt have never heard of math at the 90 level. While I didn’t have the opportunity to read Mezrich’s popular book, (caught up as I was in learning to knit), I received a crash course in the events in Hollywood's big screen adaptation called 21 directed by Robert Luketic. The film stars up-and-coming talent Jim Sturgess (a.k.a. the dreamy lad from Across the Universe) as M.I.T. senior Ben Campbell who excels in his studies and extracurricular technology activities with his two best friends. 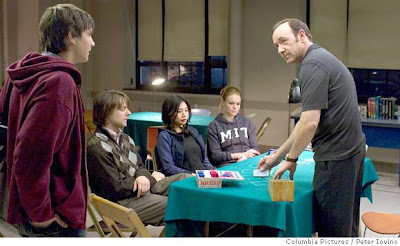 Until he meets Professor Rosa (Kevin Spacey who also served as a producer on the film) Ben’s only experience with gambling is hoping for a long-shot full ride scholarship to cover the $300,000.00 price-tag of Harvard Medical School and feeling an attraction for his beautiful and far less socially awkward classmate Jill Taylor (Kate Bosworth). That all changes when he’s granted access to a group he mistakes for a math club as Rosa coaches his brightest students including Bosworth, Aaron Yoo, Liza Lapira, and Jacob Pitts in the legal yet morally gray and incessantly frowned upon skill of counting cards in blackjack to take advantage of the game’s weakness which is that it can be beaten by the chosen few prodigies with the skills and time. Employing a system of gestures and innocuous words that double for the table's count when it heats up or cools down, the team travels to Las Vegas on weekends where the nerdy kids become high rollers in casinos, suites and nightclubs. Dividing itself in half, the group consists of those who play the minimum and signal (mostly the women who unquestioningly abide by Rosa’s sexism) and the two “big players,” including Pitts’ Fisher who has begun to grow an ego and the newest participant Ben who, after initially turning down the opportunity, lets his hormones do the talking when Taylor pays him a visit at his after school job where he’s been granted a promotion to $8.00 an hour. Although Mezrich’s book took place in the 90’s, Luketic’s film which is loosely based on the source material in a script by Peter Steinfeld and Allan Loeb is set in present day where the hangers-on from the criminal traditions of old Vegas are finding themselves exceedingly pushed out by computer technology along with the sort of Disney World for adults that sin city has become. To this end, the film introduces Cole Williams, played by a fierce Laurence Fishburne as a security expert who uses his own card counting skill to catch scheming gamblers and finds his attention being drawn to the new casino wiz kid, Ben Campbell, playing under an assumed name who is beginning to find he’s changing with each successive win. As scripted, the likable but bland Campbell is easily dominated by the more involving characters and I found myself wanting to know more about the females who play for a professor who tells Campbell “I don’t trust the girls." More specifically, in the case of Bosworth’s Taylor, her character's own heartbreaking experiences with the game were begging to be explored in greater detail, if only to inject a bit more emotion into this tale of logic driven, left brain geniuses. While there are some major plot contrivances and dubious twists near the end of 21, it’s such a high energy and fascinating film which admirably makes intellect (instead of gambling) seductive that we’re willing to forgive a few instances of disbelief especially in the character of Spacey who seems a bit hard to believe, yet because it’s Spacey delivering these lines with crisp precision, we’re riveted all the way.